Belle and Sebastian week continues. Today, the band walk us through their ninth album, Girls in Peacetime Want to Dance, ahead of its release on January 19th. We've embedded selected tracks that are available online, but you can stream the album in full over at NPR, NME, or KCRW. Stuart Murdoch: It’s a funny business, writing songs. I’m in the mood to go around and ask people about how they were feeling when they wrote certain songs in their life, and how they feel about them now. Although sometimes it only takes a short time to write some songs down, you are often pouring years worth of suffering and love and experience into one short concentrated piece. I wonder if Kevin Rowland feels that way about “Come On Eileen”, or how Barney from New Order feels about “Temptation”. And you write about who you love. As time goes on you tire of writing about how you feel because really, it doesn’t change that much. Unless you have great life changing adventures: but let’s admit it, most of those kind of adventures don’t often happen to people in bands. Because people in bands tend to make records and tour. So people in bands start to write songs about making records and touring, and they aren’t usually as good as the early stuff. But occasionally a window opens that causes you to look way back into your past. My reason for wanting to look back so far is because this time last year, when we were writing this record, I was feeling the exact same way I felt over 20 years ago: lousy. I wrote Nobody’s Empire because my younger self looks like a hero now, a storybook hero. I wasn’t, but that’s the beauty of the passing of time. Someone told me that imagination and memory are lodged in the same part of the brain. It feels like it, as you skip easily through your recollections like you might flip through the pages of a favourite book; the lines between fact and fantasy become blurred. Stuart Murdoch: I don’t usually like to write sad songs. They depress me. People think that we probably only write sad songs, but they usually uplift at some point, at least that’s the intention. Allie is kind of a sad song because it just lays it out and doesn’t offer much of a glimmer at the end: maybe the ‘softness in your heart’ bit, but it’s not doing her much good. Bob Kildea: We have used programming on our records before, albeit with varying shades of success. On this track we decided to dig a little deeper production wise and really focus on capturing the elements that make a pop record sound great played back in a club. Once we had established the basic groove of live drums, bass and Stuarts vocal, everything else was just filling in the blanks. Ben our producer, made up the beats in the verses, which worked well in contrast to the live drums in the choruses. Not only did we have the dance floor in mind when we constructed the track, but lyrically it was also literally ABOUT the dance floor, in our case Club Divine, a long running night at Glasgow Art School, and of which we were all regulars. The building has since been completely remodelled and renovated, the 'Black and White Tiles' having been replaced with grey lino, which may not have the same ring to it, but will nonetheless provide a suitable surface upon which future generations can commit their own crimes. Sarah Martin: While trying to find a new way to link up a couple of sections of an entirely different song, I came upon this chord sequence and the main synth melody. It all seemed to fall into threes, structurally and melodically, and I sent a little demo of it to Stuart, with the title - hoping that he would be inspired to write some words and save me the torment. Instead he sent back another melody, which became the third verse, and I had to write the words myself. So it’s about love triangles, platonic and otherwise. Heroes and villains. And possible worlds: by verse 3 I have taken refuge at some other point on time’s arrow, in an alternative reality. (I was reminded of this piece I saw in the GSA degree show a few years ago, a 3-D paper cut - I have no idea who it was by, but I was moved to take a photo. Stuart Murdoch: In the aftermath of the 2010 UK general election I thought to myself, “one of these days I’m going to write a political song”. Or at least “one of these I’m going to have to write down how I feel about current events.” And then I didn’t do it. But I did get a picture in my head of a girl. She was sitting at a big old wooden table in a basement kitchen in an old house. She was alone, comfortable, just finished a big bowl of ice cream, pondering at that ponderous kind of age. And I wondered what she thought of politics and the whole situation. So I wrote the song through her and it turned into Cat With The Cream. It was a good thinking table, and for a person in dark times, it was also a good praying table, and we will forgive her if most of the praying she did was for herself. I guess, she was praying for someone bigger, braver, wiser to come along than the average ‘leader’ of the day. In the books she had read there was always a King. ...on the bass guitar at the required tempo, well, we never really looked back. Occasionally a song comes along, and one can imagine standing on a plinth to sing it. In fact, you shouldn’t sing this song without standing on a plinth first. I always thought that when we performed it, the audience should see space-time rushing past me, like at the beginning of 70s Doctor Who’s. Maybe that’s something we could arrange. Stuart Murdoch: Last year we were in Switzerland at the end of our summer shows. We had a day off there: I had borrowed a bike and was exploring the numerous paths that weaved around Zurich. I fund a nice warm leafy spot and began thinking about the upcoming album. I had a couple of songs lying around, but I knew I would have to get a pile more from somewhere. I know that I’m always saying that songs come from somewhere else, but I really believe it. Songs usually come to me just as I wake up, melody and rhythm at least, sometimes the whole thing. So while I sat there beside the allotments of Zurich, eating plums from the overhanging branches, I thought about trying to summon the Muse. I thought I could use flattery: I would write a song about waiting for the Muse to arrive. I would beseech her to show herself, knowing that the music wouldn’t be any good unless she brought her magic. So I wrote the words down, and the song became The Everlasting Muse. And it might seem like an outlandish conceit, but really, I would be nowhere without music. Stevie Jackson: The geneses of this tune, is something of an aesthetic roller coaster of influences. Started life as a track by Chris our keyboard player inspired by some Nigerian vocal music he had been listening to before going the way of late period Orange Juice, ‘On the Corner’ period Miles Davis and then ultimately Talking Heads before being remixed for the final version with the heavy spectre of ‘Kid Creole and the Coconuts’ overlooking proceedings. Kid Creole rules supreme…”He’s a wonderful thing baby”. Stuart Murdoch: I started this song ages ago, the only ‘archive’ song on the LP. I stumbled over it a jotter from 1995 or so, and the tune came back to me immediately with every little twist and turn intact. I didn’t have to change much, I added the last verse. I remember the feeling of writing it, and that’s the important thing. I thought we (the band) could still get it in recording. The song was from back in the day, when I often imagined wayward heroines in the same predicament that I was in. I used to imagine the kind of person that if I wished I could run into, round the next corner. The sentiment was based on a sermon that our then minister, John Christie, preached about simply getting through a dark night, and the hope of morning. In this case he was talking about Easter Morning. I always used to leave the church a bit giddy, wondering for the rest of the day how all that stuff should be applied to the streets and tenements of my mouldy old town. Stuart Murdoch: I don’t know what happened with this tune. It started off pretty bad, a melody that I was writing terrible go-nowhere words to. Then I had the idea that it should be a duet, and it took off from there. I wanted Dee Dee Penny to sing the girl’s part; ever since she auditioned for God Help The Girl I thought I would write a song for her. By chance the Dum Dum Girls were coming through Atlanta while we were there recording.. it was meant to be. The band put down the track with a guide vocal. I had hastily written a long “improvised” end section. When Dee Dee came into the studio I did my lead vocal with her, so that we could ‘act it out’ in real time. When it came to the end section, it felt like the two characters were meeting for the first time, singing off each other, swinging between the coy and confessional. Out of the times other people have sung my songs, this is my favourite. Sarah Martin: Sometimes ideas just seem to be in the ether. I hadn’t long finished this song when I ran into my old philosophy tutor and she told me about her new paper, and I figured that we’d written about the same thing - I’m sure she did it in a more general and rigourous way than my rather specific approach. We’re woven together by language, culture, memory… from the tell-tale traces left by the people we’ve known, we can read each other like a book. Stuart Murdoch: I remember explaining this song to the group when we were in the practice room. They got the feel of it within a half an hour. I thought we should just put it to one side, let it ride, see what happened when we got to Atlanta. We did that with a few of the numbers I think, Ever Had A Little Faith, Cat With The Cream. We didn’t want to cook them, just left them al dente. I think this one of the many songs on the record that shows off the skill of producer Ben Allen and his crew of ultra capable engineers. This track would be pretty useless unless it had just this sound. For someone to come in, get it, deliver it – that’s like landing a spaceship on a comet or something. This piece is part of our Belle and Sebastian week, which you can find compiled here. The band are guest-editing the site to celebrate their new album Girls in Peacetime Want to Dance, which is released on January 19th 2015 via Matador Records. 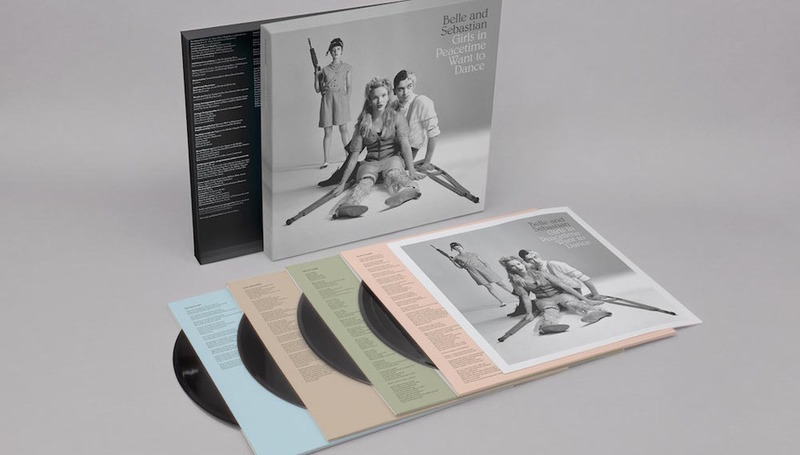 Pick up a copy of the album and check out live dates on belleandsebastian.com.